Look at this stunning sunrise? Doesn’t that give you a hint of the beautiful day about to unfold at French Creek for WOW’s Annual Waterfowling Workshop? And a special day it was! The 30 enthused WOWomen were ready to learn about shooting patterns and moving targets; about setting decoy patterns and wind effects; about protocol in duck blinds; about successfully working with retrievers, and about safety and awareness in the blind and in the field. And so they embarked on a day of new experiences and “aha” moments. Laughter erupted as the women tried their first duck calls! There were unexpected moments (but with smiles) while cleaning ducks, when participants learned how and why you do that a certain way. And after that Field-to-Table session, tasting duck kabobs fresh off the grill brought the big picture of hunting full circle. 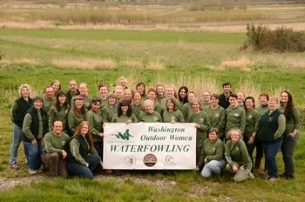 WDFW Biologist Matt Wilson showed the women the strong connection between conservation and duck hunting. He educated them on species identification, reasons for regulations and ongoing research and education statewide. The WOW, French Creek and WDFW instructors knew exactly what to teach and the results were insight, greater understanding, motivation and fun! Thank you to French Creek for use of their amazing site, and to those who helped instruct, facilitate and welcome WOW’s future Waterfowlers! Thanks to Conway Kennels for their dogs and training tips!